> Making a Dredd movie is something lots of us would love to do but I’m sure it’d never get past the daydream stage. What was it that gave you that final push and think “I’m actually going to do it”? For me the initial inspiration for the project was seeing Dan Carey-George’s replica Dredd props. He’d already made the Lawgiver and a version of the helmet. I got in touch with him and we started chatting about making a fan film, discussing how it could be produced cheaply and what would be required to create a full costume. I was already making a no budget film, which I hadn’t finished, so I had a few ideas of what might be involved. We put the idea to the back of our minds until Dan met Steve Green at an industry show. Steve was just as impressed with Dan’s work and offered to join the team. He showed us his superb showreel and we were blown away. We discussed our idea for a Cursed Earth based adventure and Steve started making suggestions for other elements that he could create to make it more interesting, like the city scenes at the beginning and other cool stuff like the Lawmaster sequence. Thankfully no one seemed too put off by my lack of professional film making experience. Once Dan and Steve were part of the team, I knew it really could be done and their work attracted other talented people to the project, such as the lead actor Edmund Dehn. We had all realised that to bring the subtleties of Minty to life we would need a professional and we were very fortunate to be able to convince Edmund to join us. > Can you tell us a bit about your previous filmaking experience as you seemed to wear quite a lot of hats for this project? I’ve only produced one other very no budget project, made on MiniDV – well it was a while ago. I was tantalisingly close to completing it when Minty came along. I still intend to finish it, but Minty sort of snowballed. However it did give me experience in some of the less glamourous aspects of film making, like location sourcing, logistics, insurance, liaising with the police etc. I’m a graphic designer by day, which gave me some useful experience with art direction on photographic shoots. > The obvious choice would have been to go for a straight Dredd story. What prompted you to go for Judge Minty as your focus? Dredd is a huge character and everyone has their own interpretation of him in their heads. It would have been very difficult to create the perfect Dredd that pleased everyone with no money. We were extremely lucky to get Greg Staples on board to play the Dredd cameo. He’s got a great look for a young Dredd and he knew exactly how he wanted the character to be in his short time on screen. The reason we chose Minty was that I’d always remembered the character, even though he only had two appearances which were decades ago. He stood out as a Judge with feelings and compassion. It was an amazing piece of work by John Wagner and Mick McMahon to put that across in only five pages! I loved the contrast between Dredd who was a Clint Eastwood ‘Dirty Harry’ type and Minty who seemed more like a Henry Fonda character, reluctant to draw his pistol unless unavoidable. The Minty story also introduced elements that would become prevalent to Dredd as he grew older, such as doubts about the justice system and ‘the long walk’. 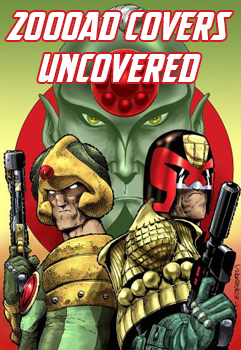 For me this brought Minty right up to date with more recent Dredd stories. > I’m not too up on the etiquette with regards fan films but I assume this was done with Rebellion’s blessing. Have you had any interactions with them with regards this and if so did they offer any advice or guidelines? We’d shown snippets to people at Rebellion as we’ve been progressing and they’ve been very encouraging. We had to show them a cut to get permission to screen at the Leeds Film Festival and Thought Bubble, which they very kindly gave. There are four rules to making a fan film – 1. Don’t make any money out of someone else’s property, 2. Don’t bring their property in to disrepute, 3. Don’t create competition with official works, and 4. Really don’t make any money out of someone else’s property! > Whilst working on the film was there any period of Dredd’s history or particular artist from the comic that influenced your creative decisions at all? I think Dan and Steve Green tried to create a look which encompassed many classic artists. 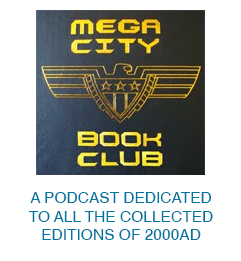 You can see touches of Brian Bolland, Carlos Ezquerra, Steve Dillon, Cam Kennedy, Colin Wilson and Colin MacNeil amongst others, throughout the story. The obvious comparison is Mick McMahon, not only am I a huge fan, he is also the original artist for Judge Minty and his work bringing the Cursed Earth to life is amazing. When I was watching the play back on set, if it looked like something Mick would do, it made me feel like we were getting it right. > Having read the script the scope and scale is a LOT bigger than I would expect from a fan film. Are you insane? If not, was it a case of aiming ambitiously and then seeing if you could pull it all together or did it grow from something smaller as more people got involved and you saw what you could achieve? Yes it was originally a LOT smaller scale. It has been expanded by the people involved. Michael Carroll fleshed out the script, as well as making it much punchier, Dan came up with more ideas for cool props we could include and Steve Green made numerous suggestions of ways he could visualise elements of Dredd and Minty’s world, Barry expanded certain sections of action in some of his story boards and often cast members made suggestions. Often my role was simply to distill these and focus on which parts were most important for telling Minty’s story. Despite the long period the film took to complete, the actual time we had at locations and in studios was very limited and it was always a rush to get the required footage for each scene. This sometimes led to Steve Green having to ‘fix’ shots and often the creativity he used to do this was better than the initial idea. > Did John Burdis offer to take the casting couch in order to be involved with this film? Ha ha – nope! 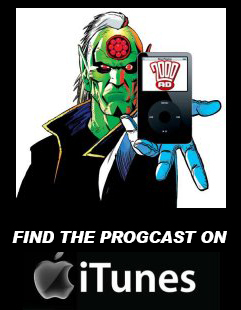 Without John and the other 2000AD fans who volunteered to help there would be no film. Not only were they essential to bring characters to life, but they also provided a wealth of expert knowledge. For me personally, it was often their enthusiasm which kept me going. I remember when we were in North Wales when the conditions were against us and we were struggling to get the required shots, I couldn’t believe how cheery and professional everyone was. > Other than “make it better” did the Stallone movie have any influence on choices you made making this film? I think Steve Green used the Hall of Justice from the Stallone film for the basis of his building, but a part from that I don’t think it influenced us at all. We were looking at the comic books for inspiration more than anything else. 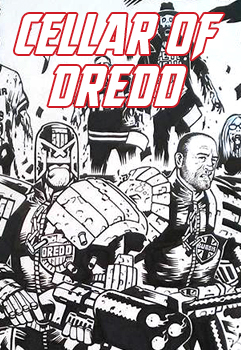 > Following on from that, I assume you’ve seen the new Dredd film. Had it been released two years earlier do you think seeing that would have had any effect on your input? I can’t speak for other people involved in the project, but for me Judge Minty was partially created because there wasn’t a good portrayal of Dredd’s world, as I saw it. I think that the new Dredd film is excellent, if it had been around four years ago I doubt I would have started with Minty. I love the approach the new Dredd film takes and the way the character is presented. We had also considered going down the more realistic route with the design style in Minty, but thankfully Dan and Steve Green pushed for a more comic book based style and thank goodness they did, because I think this approach has given us a point of difference from the new Dredd film and a reason for audiences to watch. > If you could go back and give yourself some advice at the project’s beginning, what would that be? Fewer characters and locations. Suitable locations became a real stumbling block on the project. We were lucky to find the ones we did, but they were spread across the country and asking the numerous cast and crew to travel large distances was always a bit of a risk. I was amazed that people turned up at all. > The film gets it’s premier at Thoughtbubble this coming weekend. Can you tell us a bit about that and how you’re feeling now it’s finally going to get before an audience? I think we’ve been ‘lucky’ that we’ve still been adding finishing touches to the film right up until the last minute. This has meant I haven’t really had time to think about it too much. I’m confident about the work other people have put into the film, but it’s difficult to be objective about my own contribution as I’ve been so close to it for so long. > For those not attending Thoughtbubble… actually sod them. For ME who isn’t attending Thought Bubble can you let us know how we’ll be able to see this and what future plans you have for the completed film? Was there ever any possibility of it getting included on the Dredd3D release? We are hoping to arrange future screenings at Film Festivals and Comic Conventions throughout the UK and the rest of the world, but nothing is set in stone at this moment. The ‘plan’ is to put the film online sometime after this. I doubt there was ever a chance of the film being included on the Dredd3D DVD. Even if it had been finished in time and been something they wanted, there are a numerous small legal problems which would have had to have been addressed. > Lastly can you tell us what else you’ve got in the pipeline and if there’s any way people can keep up with what you are working on. I don’t have anything immediate in the pipeline. I will hopefully be submitting Minty to festivals and conventions, for the next few months, then helping promote any screenings. I’ve had a few projects at the back of my mind for a while, but have tried to focus on Minty.